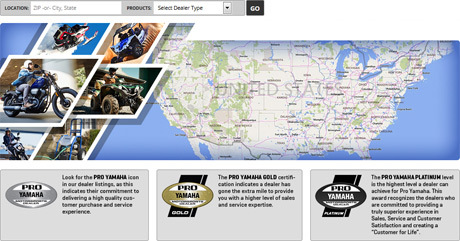 Yamaha Dealers are trained to Service and Sell Yamaha products to ensure you have an exceptional ownership experience. With a large North American dealer network we have you covered no matter where your Adventure takes you. With a dealer network covering both metro and rural markets, Yamaha dealers are committed to the needs of their customers. Whether it’s helping new riders find the perfect first machine or helping experienced riders find their next new Yamaha, our dealers are always ready, able and willing to go the extra mile to make the purchase experience a positive, enjoyable event. There is nothing more exciting than buying a new Yamaha. And, to make owning a new Yamaha a special experience, our dealers make sure customers leave the dealership confident in understanding how their new machine works and operates. Yamaha dealers take the time to answer questions, demonstrate features and prepare the new owner to get the most out of their new Yamaha. From sport riders to farmers and ranchers to the Motorsports family who loves the recreation of enjoying the outdoors on their Yamaha ATV or Side by Side, the Yamaha dealer is always there to support riders and owners to make sure they are prepared for the next real adventure.